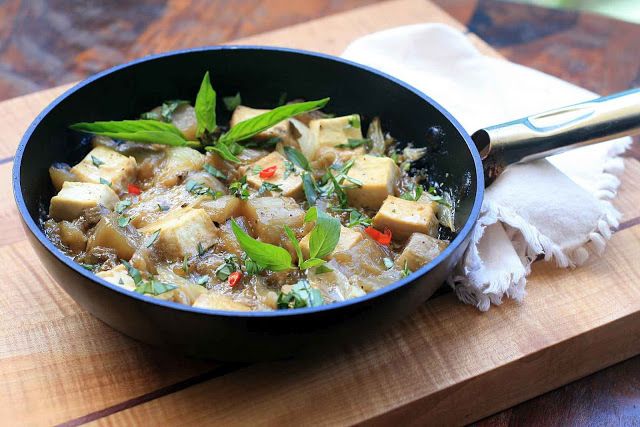 Although there are plenty of vegan and/or vegetarian recipes here on Girl Cooks World, there’s only one with tofu. 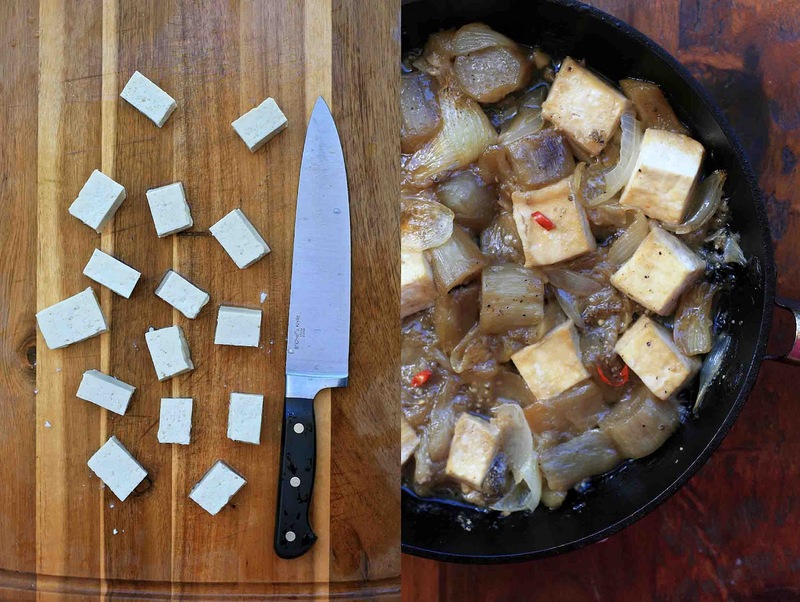 It’s not that I dislike tofu, but there’s just a lot of other things that I like even better. But things have been pretty meat-heavy around here lately, so I thought it was time to expand my horizons a bit and give the beloved bean curd another day in the sun. I’ve been a super-fan of all the Vietnamese kho dishes that I’ve cooked so far; the sauces tend to be thick, sweet and flavorful. 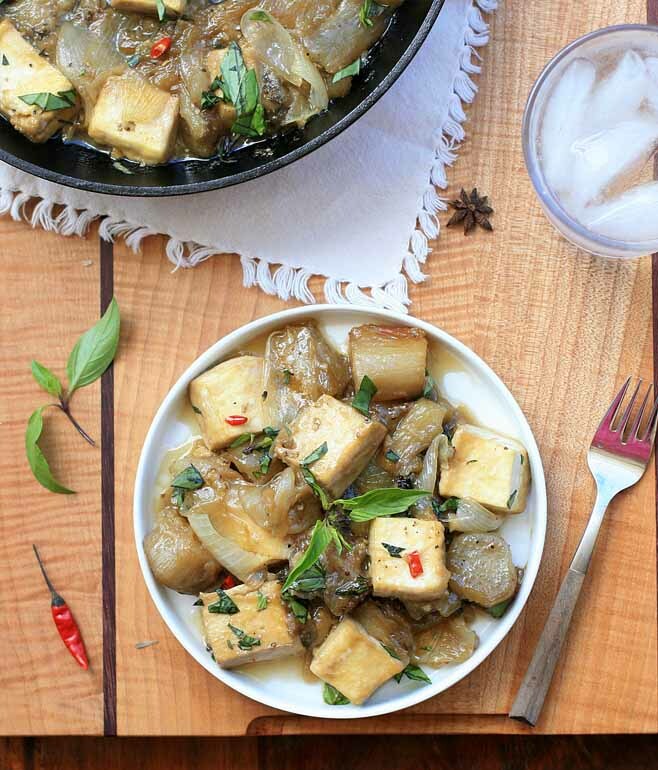 It’s been magic for both chicken and pork, so I figured that it would also work for this eggplant and tofu dish. And it does. 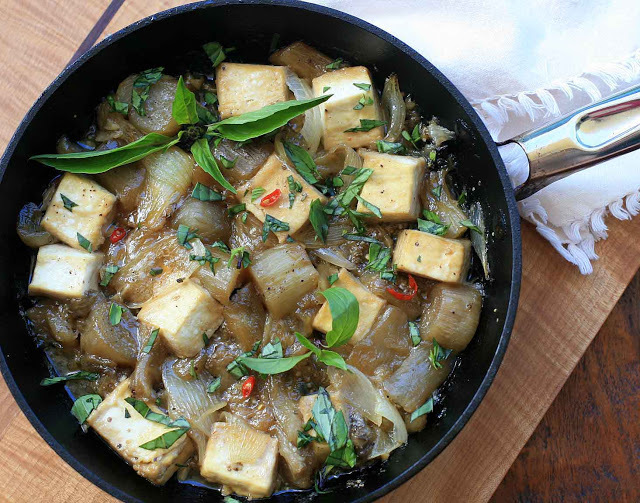 A long, slow simmer practically melts the eggplant into smooth, velvety chunks, which provides a nice contrast with the firm tofu. You have the sweet, salty and sticky sauce that’s typical in kho dishes but with a little flavor twist courtesy of the star anise. 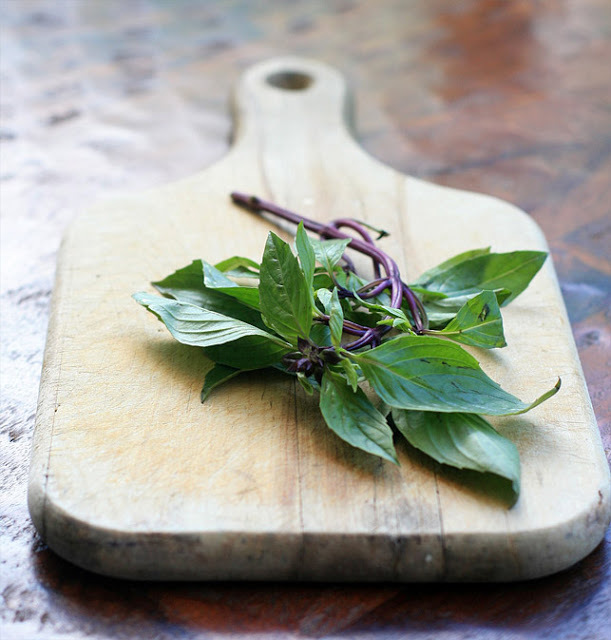 A hefty sprinkle of chopped Thai basil adds an element of freshness. I should note that because there’s fish sauce, the dish isn’t vegetarian. However, I have seen vegetarian versions of fish sauce at the market, so vegans and vegetarians might want to check those out since the rest of the ingredients are both vegan/vegetarian-friendly. Place the eggplant chunks in a colander set over a large plate and sprinkle with the salt. 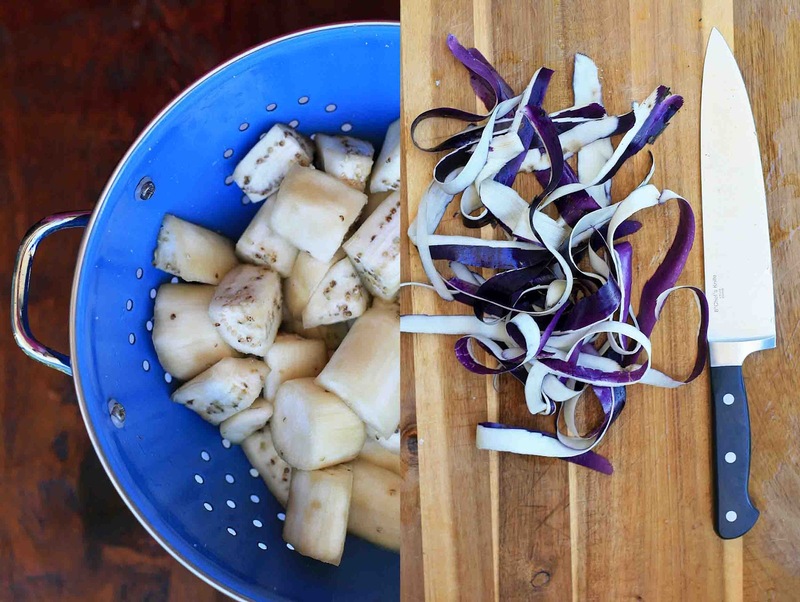 Use your hands to gently massage the salt into the eggplant. Let sit for 20 minutes. Rinse the eggplant under cold water. Pat the eggplant dry. Place in a medium bowl and toss with the sugar. Heat the oil in a large skillet or saute pan over medium heat. Add the eggplant and cook, stirring for 2-3 minutes. 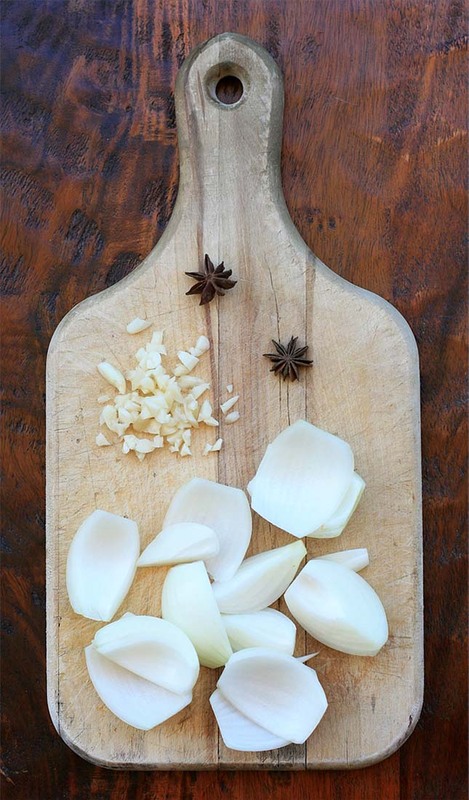 Add the onion, garlic, star anise, and cook, stirring for 4-5 minutes. Add the tofu, fish sauce, chile, coconut juice and give the mixture a gentle stir. Bring the mixture to a boil and then reduce heat, cover and simmer gently for 15 minutes. Remove the lid and let the mixture simmer without stirring until the liquid has reduced to a thick sauce. Remove from heat and sprinkle with black pepper and the Thai basil leaves. Serve with rice.